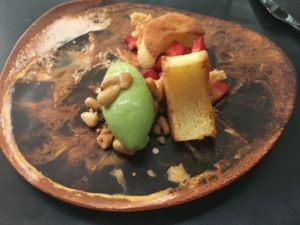 About halfway through our meal at Pineapple and Pearls I offer these words of wisdom to chef/owner Aaron Silverman to express how I feel about his new restaurant: “HOLY CRAP.” It’s hard to be articulate when your mind is in the midst of being blown. We are seated at the counter, only a few feet away from Chef Silverman. Our vantage point gives us an opportunity to fully immerse ourselves in the experience, as we marvel at the artistry and precision that the team pours into crafting each dish. Aaron Silverman was recently named one of Food & Wine‘s Best New Chefs 2016 for Rose’s Luxury, my favorite DC restaurant. Admittedly, the bloom has faded for me just a tad. It’s hard to maintain the honeymoon phase with any restaurant, and I’ve dined here multiple times. Still I always depart Rose’s with profound respect for the unique food and special brand of service. This is why I find the prospect of dining at Pineapple and Pearls, Silverman’s follow-up act, so exciting. As details about Pineapple and Pearls emerge, skepticism surfaces among some DC diners. Would there be enough demand for a restaurant charging $250 per person for a 15-course dinner? The fact that the price includes drinks, tax, and service makes the cost easier to swallow. It’s a plus that payment is made in advance so there are no surprises, or even a bill to pay at the end of the night. My husband and I justify the expense as his birthday and my early Mother’s Day celebration. We are greeted at the door with a festive bourbon cocktail, created by Beverage Director Jeff Faile. Moments later we are welcomed by Joe, who introduces himself as our primary server for the evening. I can only surmise that the grin on my face makes me look like a lunatic, but Joe seems unfazed. It’s only week two for Pineapple and Pearls, and I wonder how much tinkering is still to be done. Silverman tells us he expects the menu to evolve. 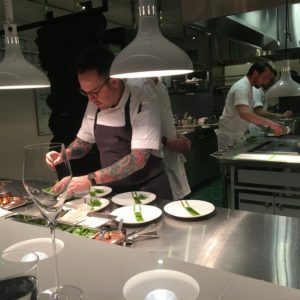 He is quick to acknowledge his team, including head chef Scott Muns, for their role in developing dishes and continually exploring the possibilities. There is no singular theme to the food. 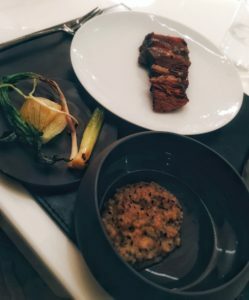 Several dishes are Japanese-inspired, there’s a dish with Provençal influences, a smoked beef rib is enhanced by Mexican mole sauce, and an egg drop soup has a Chinese accent. While we’ve dined at similarly priced restaurants that infuse wizardry into their presentation, the approach here is more subtle and playful, while still captivating. 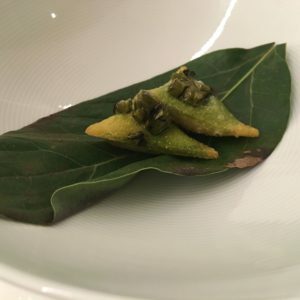 The meal begins with two small plates that sound deceptively ordinary: ranch and spring onion bite and masa chip and dip. Not ordinary at all, just an early harbinger of the depths of flavor that lie ahead. A pleasant young man works diligently to ensure that our places are cleared of food remnants before each course is served. I’m a messy eater, and I feel obliged to issue a warning that I will keep him on his toes. 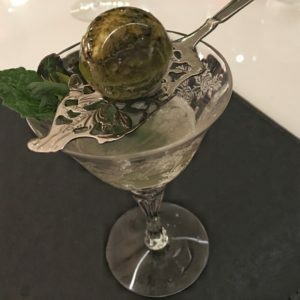 An alluring fennel bonbon rests above an absinthe cocktail. It is whimsical food and drink all rolled into one. 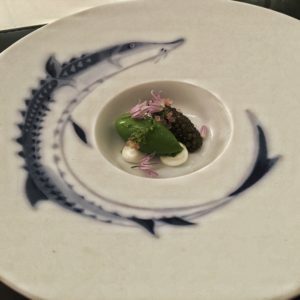 Avocado paired with ostreta caviar showcases a precise attention to detail in the food, as well as to the vessel in which it is served. Every plate, glass, and utensil exhibits flair. 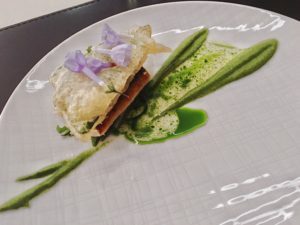 We are mesmerized by Silverman as he turns his focus to painting a plate with wild ramp puree, which he tops with a crispy wisp of Spanish mackerel, and then delicately adds a sprig of Virginia bluebell. When I initially book the reservation, I note that my husband doesn’t eat meat or shellfish. I hold my breath until I receive a reply, joking to my husband that if necessary I’ll celebrate his birthday without him. He is not amused. We’re pleasantly surprised at how few of the dishes actually require modification for his restrictions. Inventive pairings of seasonable vegetables and seafood prevail. 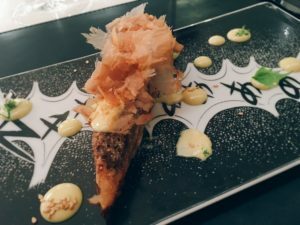 White asparagus is wrapped in a crispy pancake and topped with bonito flakes. My version incorporates chicken mousse; his is created with a mousse of fish. 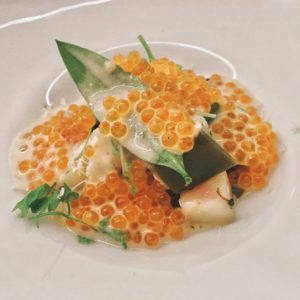 A spring vegetable barigoule is so generously adorned with trout roe, that I can’t quite finish it. But my husband is mirthful to be offered the excess. Our meals diverge most when I am served slices of mole smoked beef rib served with grits and a trio of sauces- my favorite of which is a rich and spicy mole. His monkfish is minus the beef-enhanced mole sauce. I glance over sympathetically, but he is reveling in his dish as enthusiastically as I am mine. Garlic crema and stinging-nettle salsa verde occupy his full attention. A restaurant at this price level clearly has serious intentions. But Pineapple and Pearls excels because it manages to instill a lighthearted approach into very deliberate food and service. Our evening entertainment includes a birds eye view of pastry chef Kim Janusz, who infuses her own brand of creativity into the final few dishes. Pecorino cake with basil gelato delights with its varying degrees of textures and temperatures. Chocolate souffle is satisfying, but it’s the accompanying honeycomb ice cream with crispy buckwheat that thrills me with its wow factor. As our meal concludes, my husband and I share a sense of euphoria. And it’s not only because we’ve imbibed far more alcohol than we are accustomed to drinking. We’ve had an exemplary experience at Pineapple and Pearls – a perfect fusion of fine food and fun.